As I mentioned above, this is a prototype, so there might be some changes between now and the final product (especially considering stretch goals and such in the Kickstarter). So there’s that. 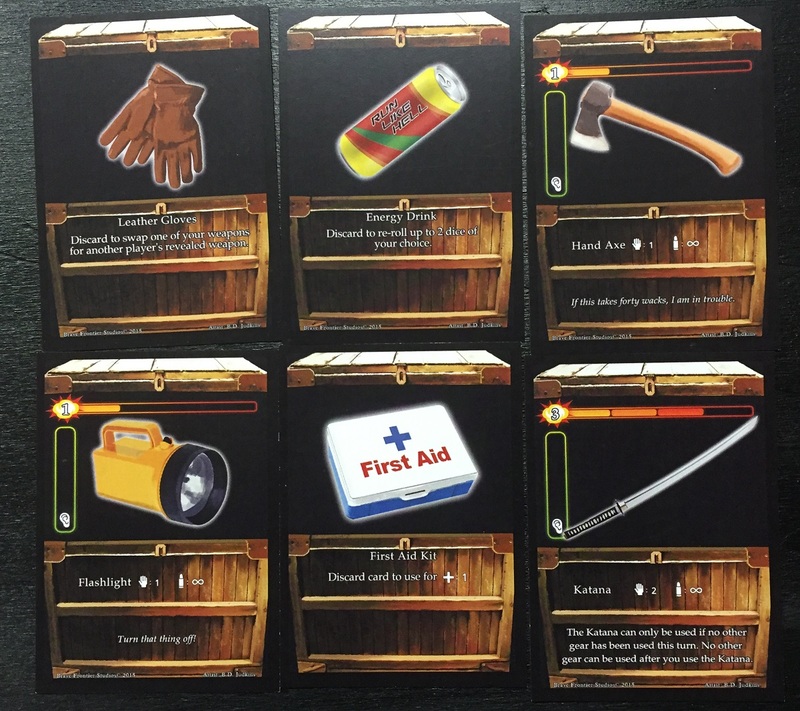 But anyway, starting out, the game comes with 100 Zombie Cards, 34 Gear Cards, 6 Character Cards, 7 Custom Dice, 3 Zone Cards, 30 Wound Counters, 2 “Cheat Sheet” Cards (so you don’t have to go back to the rulebook for some basic items), and 1 Game Manual. The goal of the game is to make it through successive waves of stronger zombies as you head towards the highway and hopefully to safety. Along the way, you’ll pick up new gear to hopefully make an easier time of the zombie-bashing. Let’s take a closer look at these components and what the stats on the various cards mean. 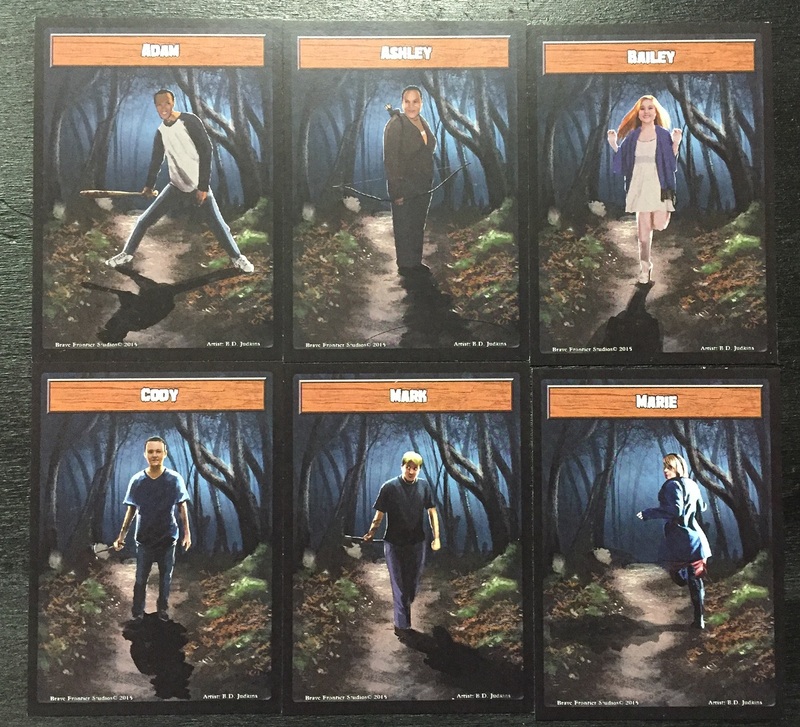 Starting with the Character cards, there are 6. They’re really just markers to show a player’s progress through the forest on their way to safety. There aren’t any differences between them (except for the character picture). The Gear cards come in two forms. There’s weapons and then there’s one-shot items. The weapons, obviously, help you defeat zombies. There’s lots of different ones, from tent spikes to flashlights to staples like katanas, shotguns, and, of course, chainsaws. All of them give you a certain number of automatic hits against any zombies you might face. More on how that works a bit later. As for the one-shot items, they tend to give you a bonus to defense, or give health back, but certain ones can also let you steal enemy weapons or reroll dice. As you can expect from being called “one-use” items, after you use them, they are discarded. The Zombie cards are broken up into four decks. Each one represents a more fierce class of zombie. 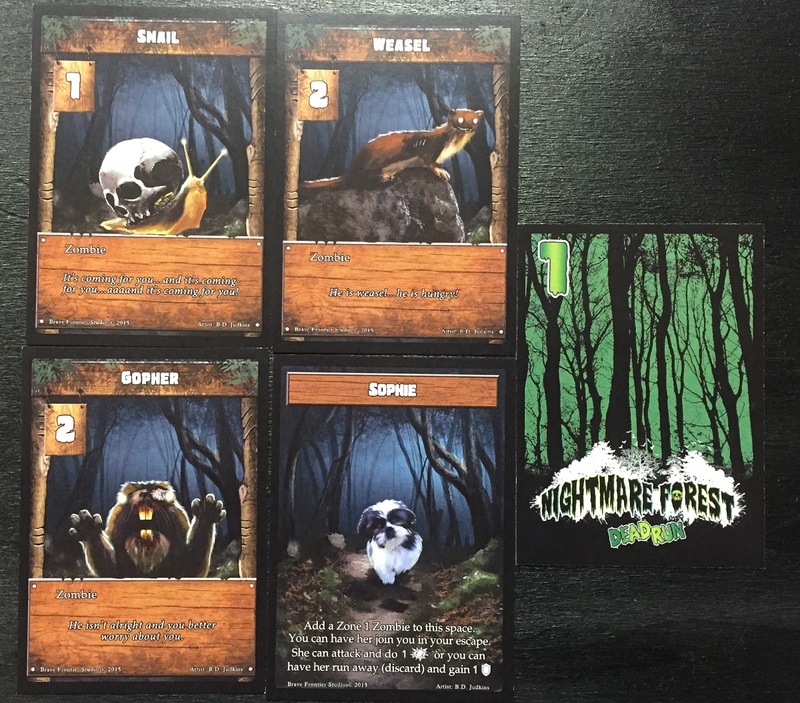 Zone 1 cards have a green backing and include things like zombie snails, weasels, and gophers. Zone 2 cards have a yellow backing and are things like raccoons, bobcats, and skunks. 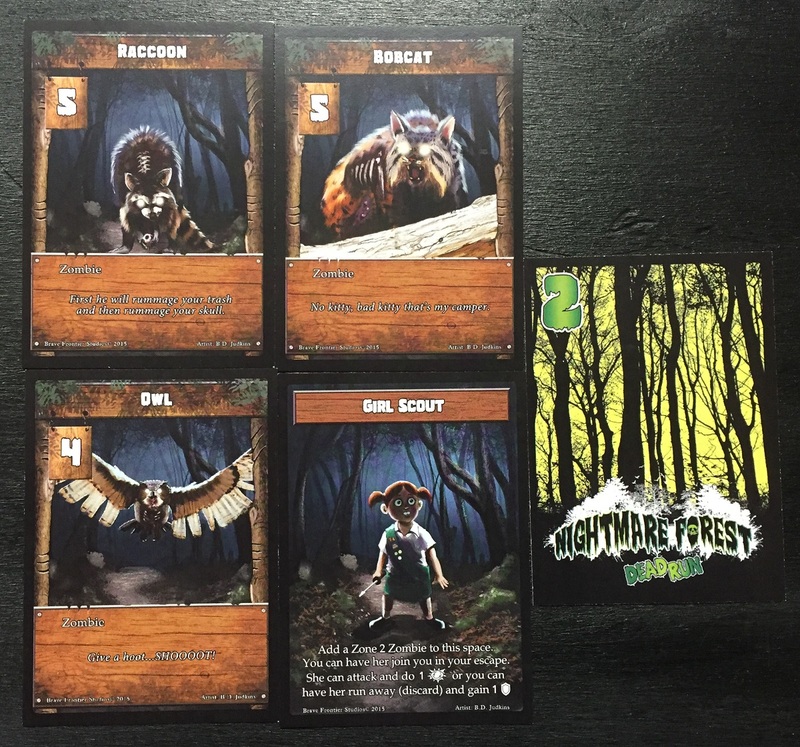 Zone 3 cards have an orange backing and are creatures like foxes, alpacas, and porcupines. Finally, there are Zone 4 cards, which have red backings. These are the “bosses” of the zombie world and are things like alligators, bison, and grizzly bears. 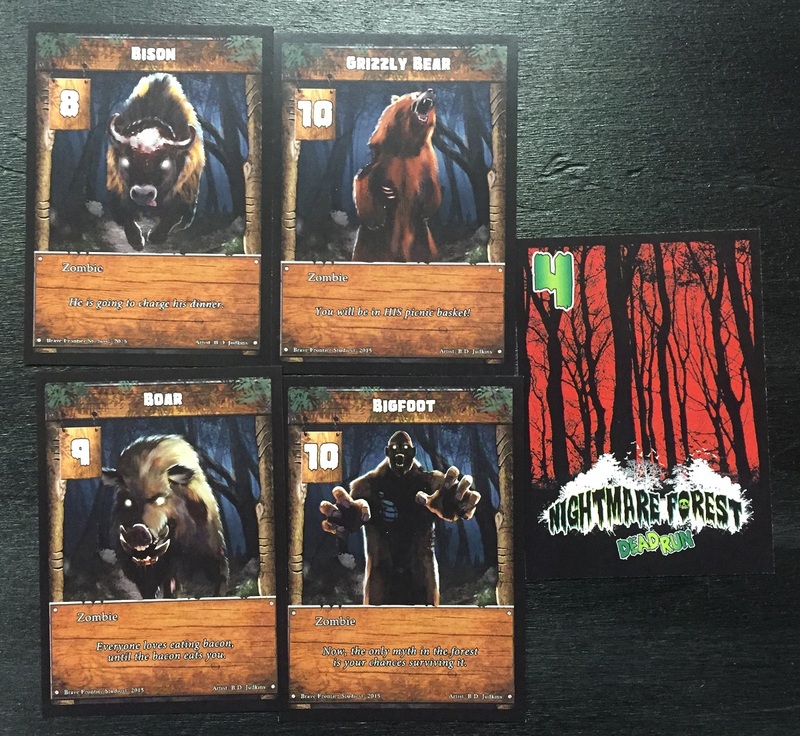 Mixed in with the Zone 1-3 cards are undergrowth, gear caches, and other survivors. So it’s not a guarantee you’ll get a zombie when you come to a new card, but it’s a pretty rare thing. Besides those cards, there’s also “Cheat Sheet” cards that have all the various icons used in the game listed on them, along with how those icons work. There are also several “Zone Cards” that can help you keep track of which Zone you are in and how many dice you get to roll in that area, along with a reminder of roughly how tough the zombies you might find there will be. 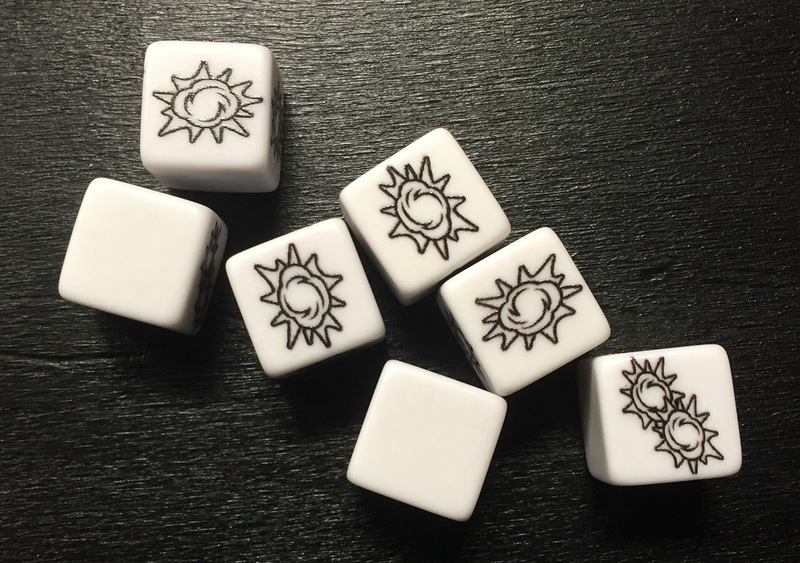 The game also comes with 7 custom dice. The dice have two blank sides, three sides that indicate a single hit, and one side that indicates a double-hit. More on how hits work when we get to attacking zombies. Setting up the game is fairly simple. The zombie cards are separated into their four different zone decks and shuffled. Then deal zombie cards out onto the table, face-down, creating a grid of zombie cards. The number of cards in each row equals the number of players for the game (so 2 players get two cards. 4 players get four cards, etc.). Deal out two rows of green cards, two rows of yellow cards, two rows of orange cards, and one row of red cards. 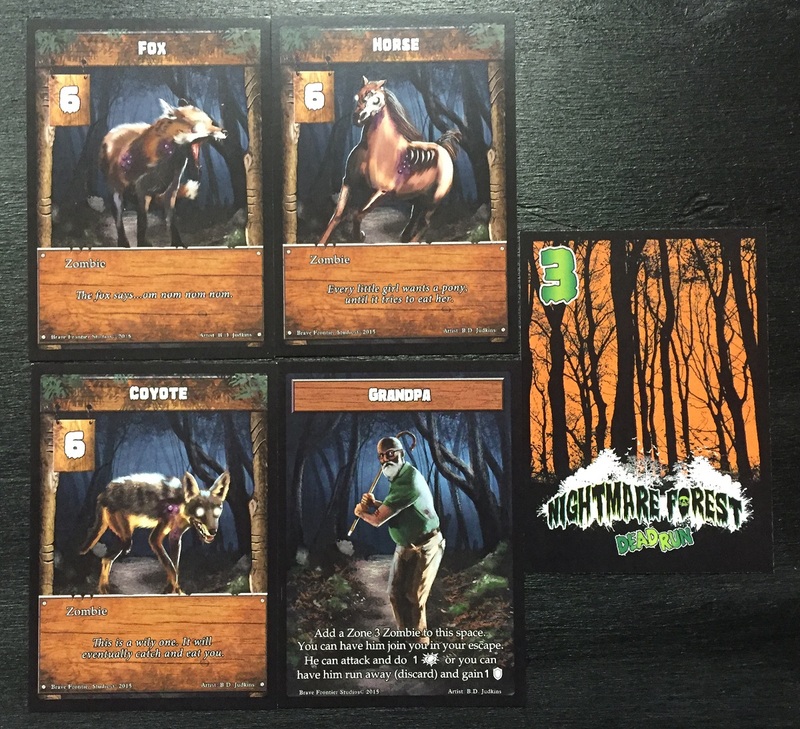 Each player is given a character card that’s placed down at the bottom of the zombie card columns. Each player gets one piece of gear drawn from the top of the Gear Deck. You’re now ready to try and make it through the gauntlet of zombies to (hopeful) safety. When you turn comes up, it’s time to try and get out of this forest. At the start of their turn, players get a certain number of dice depending on which zone they are in. 4 for Zone One. 5 for Zone Two. 6 for Zone Three. 7 for Zone Four. This is the pool of dice that they will use for their turn. Once a die is used, it is removed from your pool and you can’t roll it again. The first thing a player can do on their turn is they can choose to search for new gear. They can roll as many dice as they want in order to do this (including 0 if they don’t want to search). If you roll 0 hits, then you don’t find anything. If you roll 1 hit, you draw the top card from the Equipment deck. If you roll 2+ hits, you draw the top 2 cards from the Equipment deck and choose to keep one (discarding the other). After you have searched (or chosen not to), it’s time to fight zombies. If there’s a face-up zombie card already in front of your character, you must fight it. If the card in front of your character is face-down, flip it over. If it’s a zombie, you’ll fight it. If it’s one of the other types of cards in the deck, follow the instructions on it. But really, we know we’re here to fight zombies. So let’s fight zombies! Each zombie has a health value associated with it. When you attack, you choose any equipment you want to use during the attack (certain equipment can only be used a certain number of times before they run out of ammo, so choose wisely). All of the weapons require a certain number of “hands” to use. You only have two hands to use at a time, so you can’t use more hands of gear than you actually have hands. Get it? Anyway, after you pick which equipment you want to use, you pick how many dice you want to roll for the attack. Then roll those dice, counting up the hits you roll, as well as any automatic hits granted by equipment. If the total is equal to or greater than the health value of the zombie, you defeat it. Discard the zombie, move your character up into that empty space on the grid, and regain one of your dice to your dice pool. If your total number of hits is less than the zombie’s health, you take a wound (unless you have equipment that can save you from that). If you get to 5 wounds, you’re eaten. Killing a zombie is an “all or nothing” sort of deal. Either you’ve taken them out or they’re chewing on your face. That’s just how it goes. After your attack, you can choose to be bold and press on through the forest. If you do, you either fight any face-up zombies in front of you (if you failed your attack, for example) or flip over the next card in the line and do as indicated on the card (either fighting another zombie or coming across one of the other types of cards). Remember, though, you only get so many dice during your turn. If you’ve already used up some searching and fighting a zombie, you might not have all that many left in order to take on any new walking dead you come across. After you finish all your attacking for the turn, you can once more attempt to search. This is just like at the start of the turn, but with only whatever dice you might have left in your dice pool. Again, if you roll 1 hit, you can draw an equipment card. If you roll 2+ hits, you can draw two and pick one (discarding the other). If you don’t roll any hits, well… you just wasted some dice, but it was the end of your turn, anyway, so no real big deal. You can only have three pieces of equipment at a time. So what do you do with the extra stuff? Well, you can chuck it at your opponents, of course! Doing so can slow down your opponent by forcing them to fight low-level zombies, depleting their dice pool on weaklings so they have to think twice about fighting the rougher stuff. To toss a piece of equipment, pick an opponent who is further ahead than you (you can’t throw equipment at people behind or next to you, or at players in Zone 4). Then, pick a piece of equipment to throw. Discard that and roll a single die (this is not part of anyone’s dice pool). If any hits are rolled, place a Zone 1 zombie card underneath the character. For that character to advance, they will need to defeat that zombie first. Note: there can only be two zombies in a space at any given time. So if one guy’s far out ahead, and there’s 4 people behind him, only the first two tosses will attract zombies. The game ends when someone either makes it through their Zone 4 boss and escapes to the highway or everyone ends up as zombiefood. 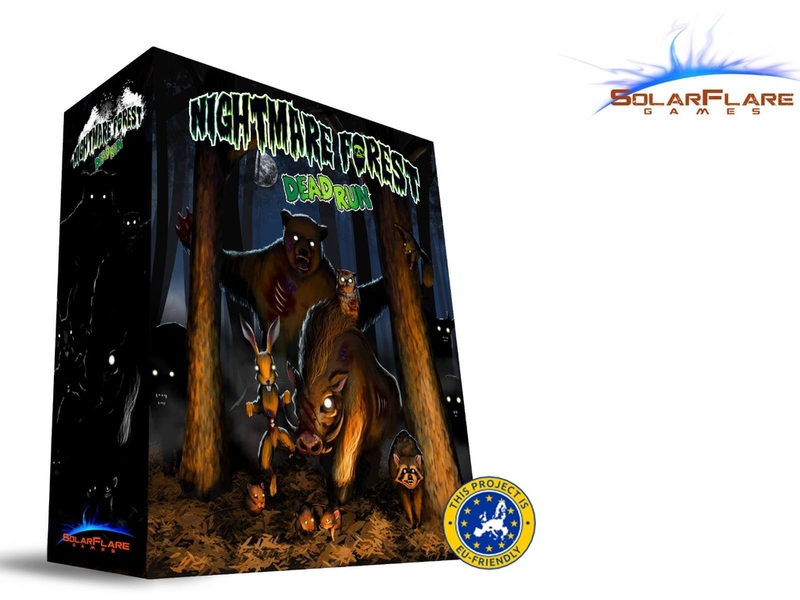 Nightmare Forest: Dead Run is a fun and interesting game. It’s very quick to learn and play. The simple mechanics mean you can get started pretty much within 5min of opening the box. I like the player interaction with being able to Throw items if someone’s ahead of you. It might not seem like much initially, but having someone waste a couple dice from their pool on taking out a zombie chipmunk can give you the opportunity to catch up. Some of the other one-shot items also let you do things like steal items away from your opponent. So if they’ve been saving a shotgun for the last round, you can snag it away from them before they get there. I absolutely love the different zombie animals in the game. I really did laugh out loud the first time I read the text on the Zombie Snail. 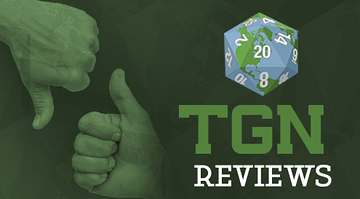 As I mentioned, the Kickstarter campaign is up and running now. You should go check it out.